In "Main-Street" Nathaniel Hawthorne recounts a reasonably accurate record of 17th century Salem. His portrayal of the changing role of Indians in this one-hundred-year period is romanticized and sometimes close to caricatures as first he describes Indians as noble savages and later as stumbling drunks. "Main-Street" is a narrative history of the metamorphosis of a pathway through a primordial, untouched forest barely trodden by moccasined Indians into a busy main-street thoroughfare that winds through a large, bustling town trodden by increasingly sophisticated white settlers. In the story a showman turns the crank of a picture show that captures a 100- year history of a single spot in New England to an audience which includes a critical viewer who mocks the poor workmanship of the cardboard people and buildings while he belittles the story-teller's condensed portrayal of people important to the region. Hawthorne romanticizes the "majestic and queenly" Squaw Sachem and her husband, the chief Wappacowet, as noble redmen who naively imagine that their life styles and forested homes will endure forever. 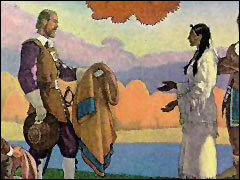 Then Hawthorne recounts the decline and disappearance of the Indian who appear originally as the majestic inhabitants of the wilderness before they become trappers who sell animal skins to the white settlers and who finally deteriorate into being drunken Indians who have succumbed to firewater. Hawthorne celebrates nature, laments its disappearance, and hints that eventually wilderness may return and reclaim the industrialized town. According to Margaret Moore in The Salem World of Nathaniel Hawthorne (16-17), Hawthorne read voraciously about the past. She believes his historical account to be based on thorough research. In "Main Street" (1852) Hawthorne repeats the theme that Indians will gradually disappear as the white race takes over the wilderness which will also vanish.